Time goes past fast even as a home mom . There will be days , my schedule is about cooking,eating, feeding, coaxing the little one to sleep , rest and cooking etc repeat itself from days to weeks. Well, am not complaining at all. In fact I thank GOD , my princess is a good baby. By 2nd months, she sleep through the night from 9pm - 6am. She is a happy baby most of the days. As I am not into carry baby all day and times, she kind of knew it and able to adapt well . Praise GOD , prayer works and I now find time to bake and hopefully can update my blog as much as I can . We are back to church and most of the activities we family used to do . This shortbread was baked for the ministry I am serving. Our church has a small cafe operate on Sunday to let people have some munch and coffee before service started each Sunday. Of course those who serve in the cafe are all volunteers . We do need more volunteers to help out. So we have the Ministry Fair Sunday to encourage people to serve in different ministry. I come across this shortbread recipe from one of my favourite blogger ->Dailydelicious. As I need some cookie that I can stamp some wording on it, I have to make sure the dough of the cookies is firm and will not be out of shape once bake. Her recipe is just perfect. 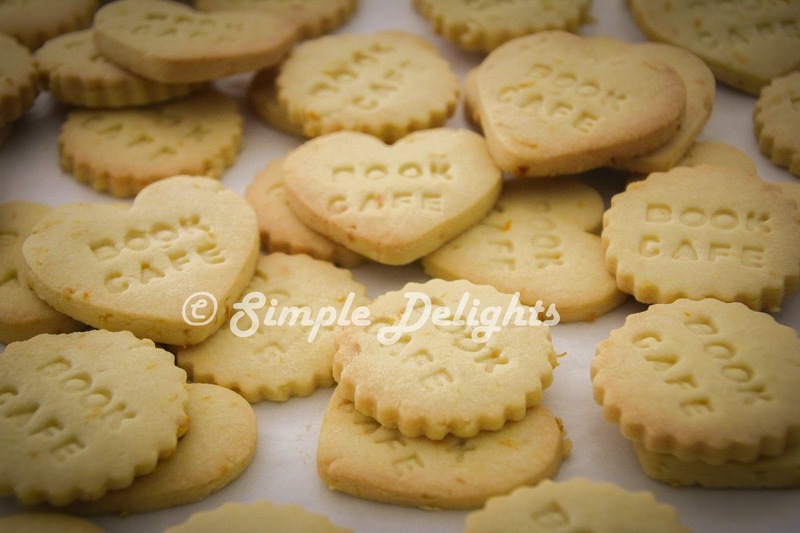 So here is the recipe I have used to make my Book Cafe Short Bread. In total I make 47pic with heart shape and round shape mould. I double the portion from the original recipe and add orange zest in it to give a hint of orange in the cookies. 1 Tbsp of Orange Zest. 1. Cut the butter into small cube and put in a mixing bowl. 2. Sift cake flour, rice flour, icing sugar and orange zest , pour over into the butter. 3. Use your fingers to mix the dry ingredient into the butter. Mix it till looks like small bits of bread crumb. 4. Knead the crumbs till stick together and smooth. 5. Wrap with the plastic and refrigerate for 1-2 hours. 6. Take the dough out from the fridge, roll the dough to 5mm thick and cut it to different desire shape. 7. Preheat oven to 160C, and line the tray with baking sheet. 8. 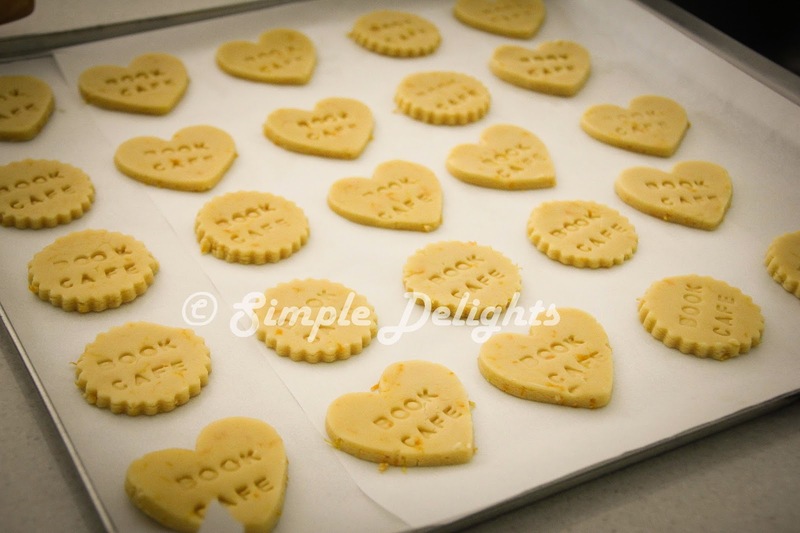 Place the cut cookies on the tray with baking sheet and press the wording you desire on the cookies. 9. Bake the cookies for 15-20min until the light golden. 10.Take the cookies out from the oven and cool on tray. Keep the cookies in airtight container. The cookies is soft but firm, it will not easily break into pieces and it hold the shape after baking. Though the cookies look "plain", the taste is simple delicious.If you want to send a message in a cookies , this might be a good choice too.